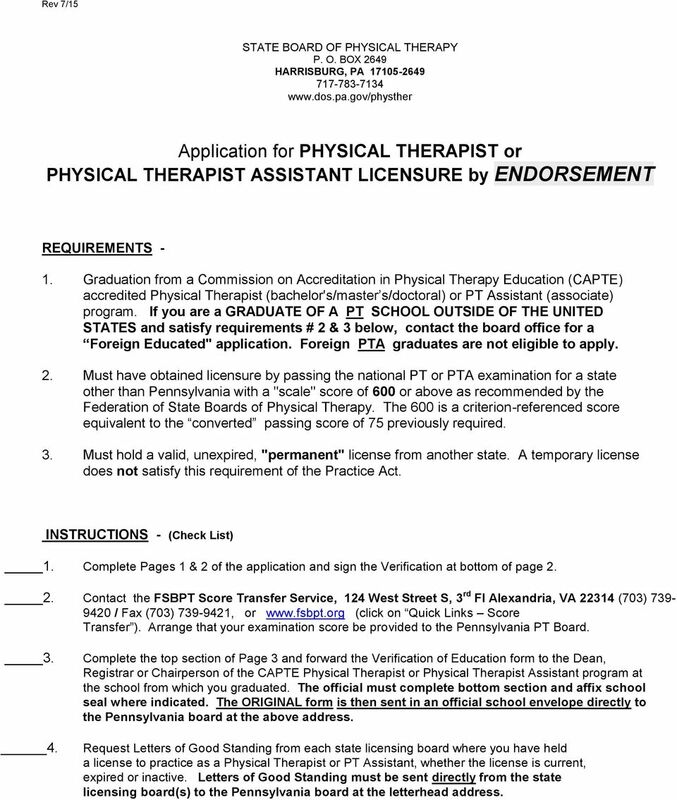 Download "PHYSICAL THERAPIST ASSISTANT LICENSURE by ENDORSEMENT"
1 STATE BOARD OF PHYSICAL THERAPY P. O. 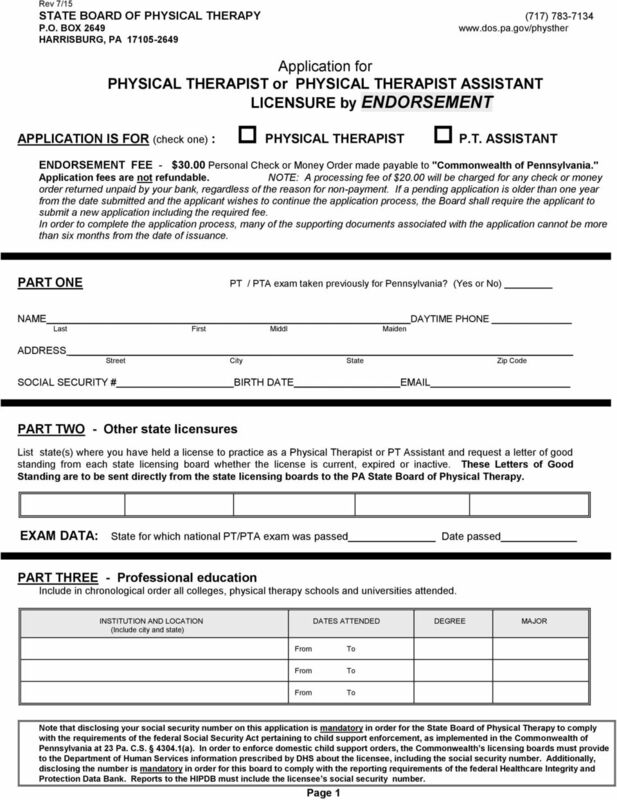 BOX Application for PHYSICAL THERAPIST or PHYSICAL THERAPIST ASSISTANT LICENSURE by ENDORSEMENT REQUIREMENTS - 1. Graduation from a Commission on Accreditation in Physical Therapy Education (CAPTE) accredited Physical Therapist (bachelor's/master s/doctoral) or PT Assistant (associate) program. If you are a GRADUATE OF A PT SCHOOL OUTSIDE OF THE UNITED STATES and satisfy requirements # 2 & 3 below, contact the board office for a Foreign Educated" application. Foreign PTA graduates are not eligible to apply. 2. 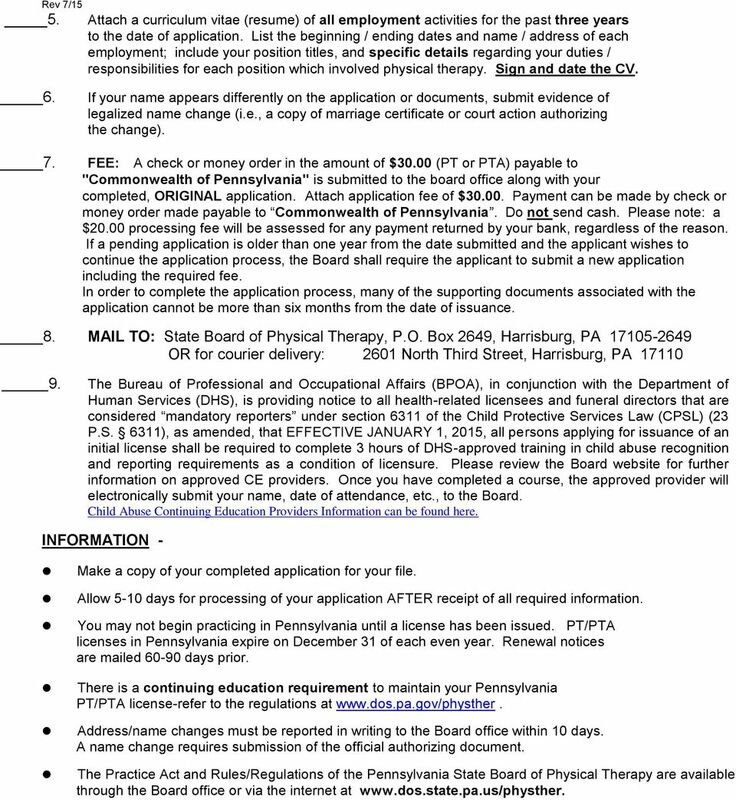 Must have obtained licensure by passing the national PT or PTA examination for a state other than Pennsylvania with a "scale" score of 600 or above as recommended by the Federation of State Boards of Physical Therapy. The 600 is a criterion-referenced score equivalent to the converted passing score of 75 previously required. 3. Must hold a valid, unexpired, "permanent" license from another state. A temporary license does not satisfy this requirement of the Practice Act. INSTRUCTIONS - (Check List) 1. 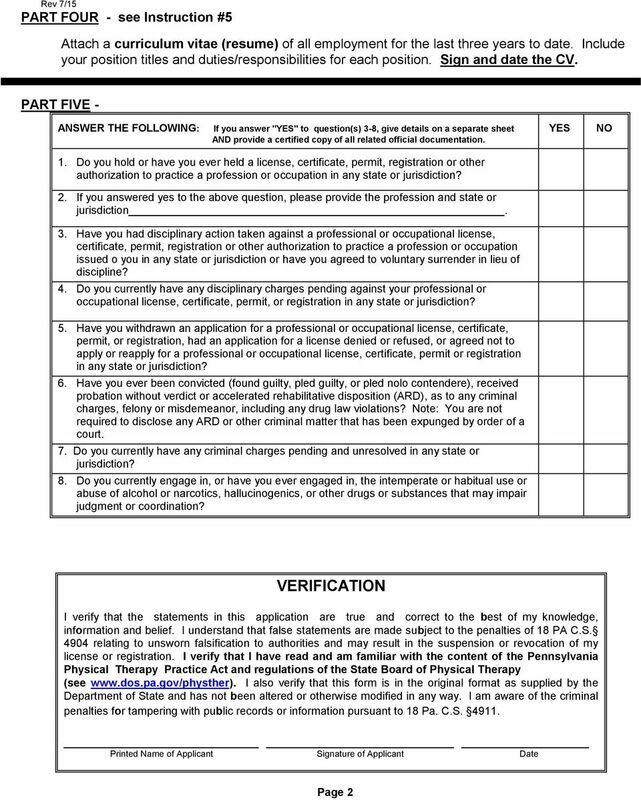 Complete Pages 1 & 2 of the application and sign the Verification at bottom of page Contact the FSBPT Score Transfer Service, 124 West Street S, 3 rd Fl Alexandria, VA (703) / Fax (703) , or (click on Quick Links Score Transfer ). 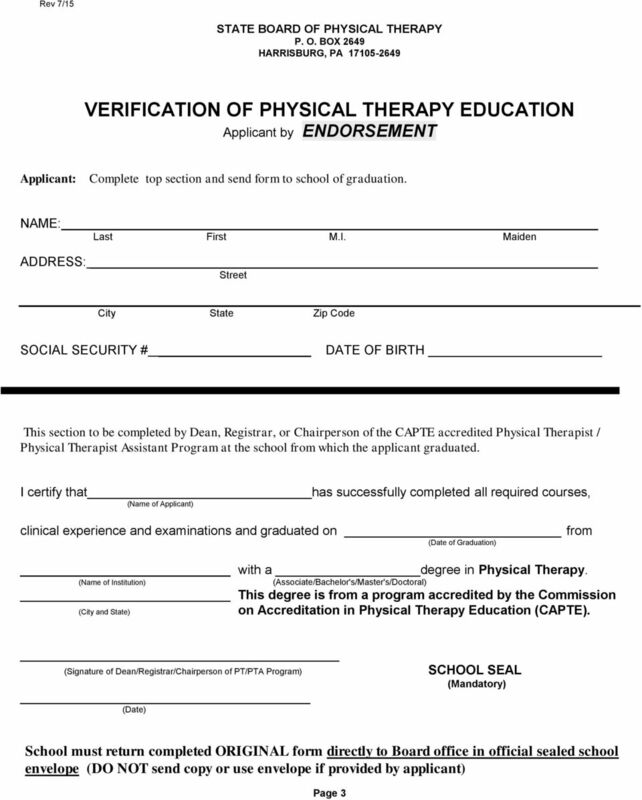 Arrange that your examination score be provided to the Pennsylvania PT Board Complete the top section of Page 3 and forward the Verification of Education form to the Dean, Registrar or Chairperson of the CAPTE Physical Therapist or Physical Therapist Assistant program at the school from which you graduated. The official must complete bottom section and affix school seal where indicated. The ORIGINAL form is then sent in an official school envelope directly to the Pennsylvania board at the above address. Request Letters of Good Standing from each state licensing board where you have held a license to practice as a Physical Therapist or PT Assistant, whether the license is current, expired or inactive. Letters of Good Standing must be sent directly from the state licensing board(s) to the Pennsylvania board at the letterhead address. NOTE: Practice as a veterinary technician in Pennsylvania may not begin until your license has been issued. 2. Be of good moral character. Have 2 recommendations completed on page 3. ALL DOCUMENTS MUST BE PROVIDED ON 8 ½ BY 11 UNSTAPLED, UNBOUND, NUMBERED, AND ONE-SIDED PAPER. Applicants will be notified within 15 working days of receipt of a completed application as to the status of the application. NOTE: All mailings will be sent to the address you indicate below; if you change your address, you must advise this office.